The Saxon Minster that was situated in what was to become Exeter's Cathedral Close was replaced over a period of about 250 years commencing in 1140, by the present, St Peter's Cathedral. The old minster became a parish church, was modified and changed over the years, named St Mary Major and then in 1865, it was demolished and a new church constructed. St Mary Major occupied a place opposite the West Front of the Cathedral - it was not universally liked as it seemed to block the view of the Cathedral. In 1971 it was decided to take it down, with the intention of building additional car parking space in an underground car park. The work proceeded down to the foundations, when someone discovered human remains. Archaeologists were called who reported that it was a Saxon burial. Further excavations took place and the foundations of the original Saxon Minster were unearthed. 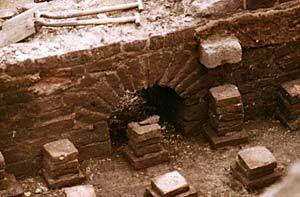 The archaeologists excavated further and were astonished to reveal Roman remains - it was soon discovered that they were the remains of a Roman Bath House. The surprise at the discovery was because up to that time it was always assumed that the Romans only had a small outpost at Exeter. The bath house, and other discoveries in the late 1960's in Exeter and beyond, suggested a larger and more important settlement. It has since been found that the Roman presence in the south west was larger and more permanent, than first thought. In fact Devon perhaps has the largest number of Roman fort remains in the south of England. The Exeter Archaeological Field Unit had uncovered and were piecing together the history of the earliest Roman stone building in the country. What they found, cut through by a Saxon burial was a floor, which was found to be the top tread of a flight of steps, which emerged to be a town basilica. At the base of the steps was found a further floor, under which there was the remains of a large, brick hypocaust or underfloor heating system, that had been part of an earlier building. 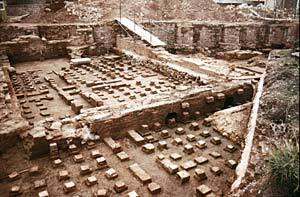 In 1972 a larger area was investigated, to reveal that the hypocaust belonged to a caldarium or hot baths, dating from AD 60-65. The hot room was 22.3 m long by 9.75 m wide. At facing ends of the room were two steps that led to the alveus or hot baths. Along one of the long walls were three small recesses, of which, the outer two contained large raised circular labrum or stone bowls. When in operation, the elaborate black and white stone floor tiles in the central area were too hot to walk on in bare feet. Adjacent to the caldarium was the trepidarium or cold room, a furnace house, service rooms and part of the palaestra or exercise yard, which was also used as a cockfighting pit. Constructing such a bath house would have been a difficult thing to undertake at the time. Five quarries had to be established to supply stone - Purbeck marble and limestone from Dorset, lead and iron ore had to be located and smelt, and clay excavated and fired into bricks and tiles. Such an undertaking was beyond the Roman army, even though they were well used to engineering work. This was the work of imported architects and craftsmen. For its time, this distant outpost of the Roman Empire had what was perhaps the most advanced bath house in the Roman world. This was building at the forefront of technology - Exeter was one of the first heating systems to employ hollow rectangular box tiles for the walls to channel hot air from beneath the floor. In addition, iron bars were laid on the tops of the supports that carried the floor above the hypocaust to strengthen it and prevent disintegration due to the heat. The Roman fortress at Exeter was manned by the Second Augustan Legion of perhaps, 5,000 legionaries and 500 cavalry who were housed in timber barracks surrounded by defensive ditches and a turf rampart enclosing 41 acres. The hot baths would have been a welcome relaxation after a day drilling or building defences, although one suspects it was only for the officers. The bath house was only in operation for a few years and by AD 68 the Legion had transferred, possibly to Gloucester and the bath house dismantled. A later basilica was built in the area. The Archaeological Unit, the City Council and the Cathedral authorities were not quite sure what to do about the find. Some wanted it to be fully exposed and a public interpretation centre be built over the remains. In the event, it was decided to cover the site with sand and grass it over, for possible resurrection at a later date. Fast forward to 2014, and the Cathedral authorities announced they were working on plans to uncover the bath house, and build an interpretation centre, with other facilities, over and to the side of the remains. The scheme is to cost £12.8 million, largely funded by the Heritage Lottery Fund. Sources - Exeter City Time Trail website, Paul Birdwell article in British Archaeology and other assorted articles. All photographs are © Alan H Mazonowicz unless otherwise labelled. This article is © 2015 David Cornforth and is not to be used without permission. 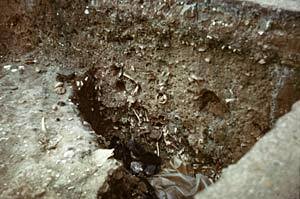 The archaeologists cut through the mediaeval burial yard revealing many human remains. 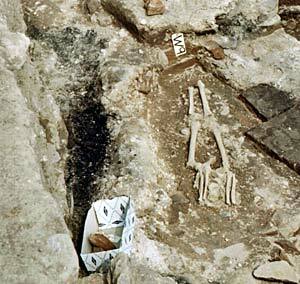 An earlier Saxon burial found at the site. 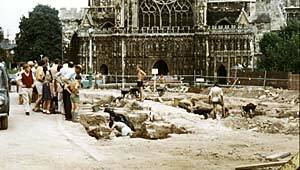 An early view of the excavations. The archaeologists where not aware of the importance of the site, and the excavation was in danger of being filled with falling small boys. A beautifully built Roman hypocaust arch.